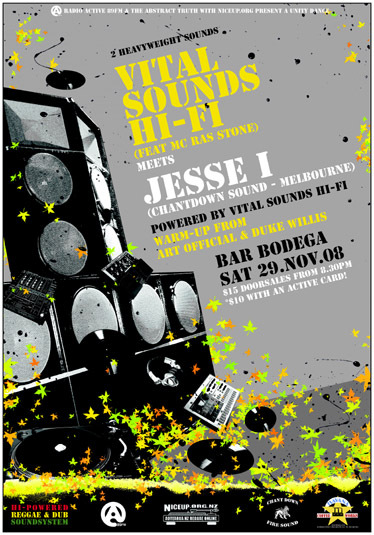 Come to Bar Bodega, Saturday 29 November, when Vital Sounds Hi-Fi host a unity dance show-casing some of Australasias' biggest reggae selectors! Featuring for the first time in Aotearoa, Jesse I (Chant Down, Melbourne), alongside NZ's heavyweight sound, Vital Sounds Hi-Fi (Manray & MC Ras Stone), with support from Art Official & Duke Willis! I like the flying mixers! Looking forward to having you two here!! Weather's looking pretty good I think! Have fun in kiwiland!!! Looking forward to pictures and audio and reports etc etc. Yes, give thanks to all who reached this dance. Although numbers were down all who did attend made it a very special night. Big thanks to all singers and players, Jesse I, Ras Stone, Duke Willis and Art Official. And to all the Vitalites who helped promote and setup. The soundsystem was sounding tuff and dropping deeper that ever ! I ran it hard and it just handled everything I threw at it. I maintain my unbroken record of noise control complaints at every dance now (starting to wear that like a badge now ), still haven't been shutdown yet, touch wood! yes, was wicked to reach both Auckland and Wellington! good to meet you too Iceberg, sorry I didn't get a chance to talk more - I didn't realise I was going to be playing for two hours, and didn't see you again when I was finished. was a great venue at the Turnaround, reminded me of the old Deep 11 days here... would have been better if it was a straight reggae night as you say, but was still a lot of fun. Wellington was less busy, but I have to say, it was a real pleasure to play on the Vital Sounds Hi-Fi... what this dance lacked in numbers, it made up for with vibes and sound! The system sounded deadly, and I especially enjoyed the chance to play some heavyweight oldies on it. Big big thanks to Manray for having me. had a great time in NZ, and am looking forward to reaching again... big ups to everyone who made this such a good trip for Troublemaker and I, especially Venus, Art Official, Paradox, Tobi, Grafta and Kristina for the hookups and hospitality! You beat me to it Jesse! Yes, massive big ups and thanks to Venus, Art Official, Paradox (man with the corn-chip hook-ups), Sticky, Grafta, Kristina for looking after us so well. Was also wicked to have met Tobi & his lady, Cian, Manray and man like Iceberg amongst heaps of others. Big tings a gwaan in Aotearoa. Had a great time and look forward to visiting again soon with more time! yea yea yea...was wicked having you two in NZ! Thought it went well in both cities...good to see some vibes going down at the Turnaround and some AK reggae massive in attendance. Must big up Cian and the crew for hosting. Def gotta get you back soon! Bless from NZ massive! Maximum respect guys, it was an absolute honour to have you in town. The session was wicked, one of most enjoyable sets I've heard in Auckland without a doubt. Big up to everyone involved in making the dances happen. As Venus says, you'll have to be back soon! iceberg, mek we link up next dance, I had a brief chat to you on the night but didn't know who you were, big up! All good bro, will definitely say hi next time.